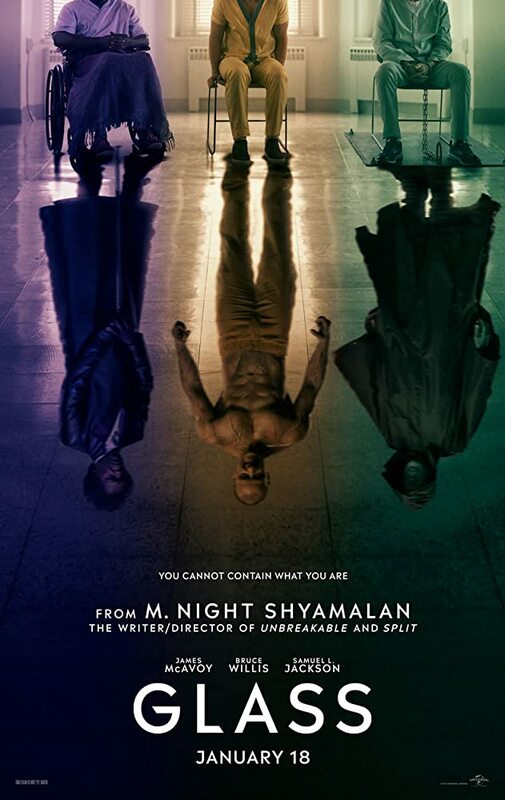 Glass was written and directed by M. Night Shyamalan, it is a sequel to Split and Unbreakable tying the two films together. In my opinion Unbreakable is practically a perfect movie and Split was one of my favorites from 2016, so it is safe to say I was quite excited for Glass. So, did it live up to my expectations? Glass is a beautiful looking film. It’s shot well, like very well. Say what you want about M. Night’s writing but the man certainly knows what he is doing with a camera. The way he uses colors to represent different characters is just so genius—you know kinda like a comic book. The first 2 acts were excellent. I was hooked—on the edge of my seat clamoring for more. M. Night seamless tied Unbreakable and Split together, we caught up with all the players—it was great. He even used deleted scenes from Unbreakable—a very nice touch. Then M. Night did his usually thing, a twist ending but it just did not work for me. There was no pay off or anything hinting it and it came outta nowhere like an RKO from Randy Orton. Once I got over the twist the real ending was a nice finish. But it just could’ve been so much better. You gotta respect M. Night though, he does what he wants and subverts many norms. The acting—oh man, it was something else. For starters Sam Jackson, he always crushes it—no surprise here. And hey guess what? Bruce Willis actually tried in this one. He has been mailing it in lately. I’m looking at you Death Wish. But Willis brought his a-game for David Dunn and I certainly appreciated that. Dunn is easily my favorite Willis character after John McClane. But this movie is James McAvoy’s 100%, which may rattle some people seeing as the movie is called Glass. McAvoy may not be the titular character but he is front and center and steals the show. He literally plays 24 characters. Every character is different from the last and it’s a serious test of his skill that he can pull it off—just going off mannerisms I can pick out what personality is in control. This movie is basically James McAvoy telling everyone he can play any role, like literally any role including a woman or a 9 year old boy. Speaking of 9 year old boys, Hedwig is easily my favorite alter—too many quotable lines, cracks me up every time. Alright, I’m done praising James McAvoy. Just one more thing to add, Sarah Paulson was a nice touch—that is all. Okay, so I liked this movie quite a bit but I could’ve liked it more. There was a lot to like and some to not like. If you’re a fan of Unbreakable or Split absolutely see this movie. If you’d like a different take on a superhero movie you’ll probably like Glass too but I would recommend seeing Unbreakable and Split beforehand. Glass is not a comic book movie but it is totally a comic book movie. I give Glass a 7.3 out of 10, would watch again. Wait…. don’t go yet. One more thing. This movie confirmed that all of M. Night’s cameos in Unbreakable, Split and Glass are the same guy and that was kind of the greatest.